COME SEE HOW OLD wrinkles have been removed for a smooth new downtown experience. 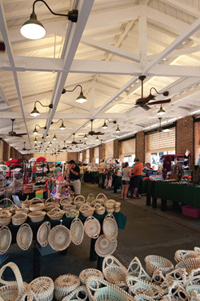 Because Holliday and Varn own so much property in the area, renovating the Market was in their best interest, as well as that of the scores of vendors and shop owners who depend on the foot traffic in the area. Over the last few years, the number of locals visiting the City Market has dwindled for a variety of reasons. And while visitors continued to shop the market, Holliday looked toward the future and, with his partners, began to formulate a plan to make improvements, not simply clean up the Market. The three open-air buildings have been completely renovated. Historic portions were restored, including adding new mortar. Roofs were repaired and replaced. Cement slabs were replaced and the blue stone re-laid. In addition, Newton said the pedestrian walkways in the open buildings have been improved dramatically, opening up views and relieving the congestion for shoppers. Although the project has been somewhat stressful to the vendors and merchants, early reports are positive. “Vendors say locals are coming down,” Newton said. A market merchant since 1975, Branham said the renovation “keeps us fresh.” With a wrought iron gate embellished with “Welcome to the Market,” the City Market will have a real entrance, she said. The final stretch of the renovation continues through the end of 2010 and is expected to be complete in the spring of 2011, at a total cost of about $5 million. The head building, which has enclosed shops, will be closed for several months while the shops are gutted. As with the open-air buildings, mortar and cement slabs will be replaced. This building also will have a skylight. “It’s all good,” said Tom Newton, manager of Charleston Accents on Market Street.